Ace your accessory game with Chanchal’s ethnic but contemporary pieces that include Kalamkari and Ikat prints on clutches and bags as well an extensive Dokra jewellery range. Accessories are important, and we all know this. So when we chanced upon this indie accessory brand, we know we had struck gold mine. Chanchal, a Bangalore-based indie brand, makes you put your money where it should be — on accessories. They don’t just do any kind of accessories, but they take upon India’s rich heritage and culture and create accessories that are contemporary but so full of ethnic beauty. Bring on the bags and jewellery challenge, girls! Clutches, totes, sling bags, and messenger bags feature extensive ethnic prints on them. Those who fancy Kalamkari will find an entire collection of clutches feature these beautiful prints in design motifs such as peacocks, hand mudras, Madhubani and floral, on silk or khana (silk, viscose and cotton yarn) material. And quite trendy too and can go well with your ethnic outfit come sangeet or reception. Sling bags, messenger bags, and totes also feature ikat and ajrakh fabric along with kalamkari. The messenger bags are almost unisex in design leaving this writer wanting one for himself. Chanchal works with local artisans and craftsmen all over India and their collection of Dokra jewellery, which is predominantly made by artisans in West Bengal and Odisha, is a testament to that. The Dokra collection is for anyone who loves the idea of pairing ethnic jewellery with western wear. Or love hoarding ethnic jewellery. Neckpieces and earrings are what the collection consists of. Neckpieces come with pendant designs and choker designs with the pendant designs feature fishes, geometric shapes, teardrop, and layered neck pieces. Earrings are of the bigger kind and feature floral and geometric shapes. 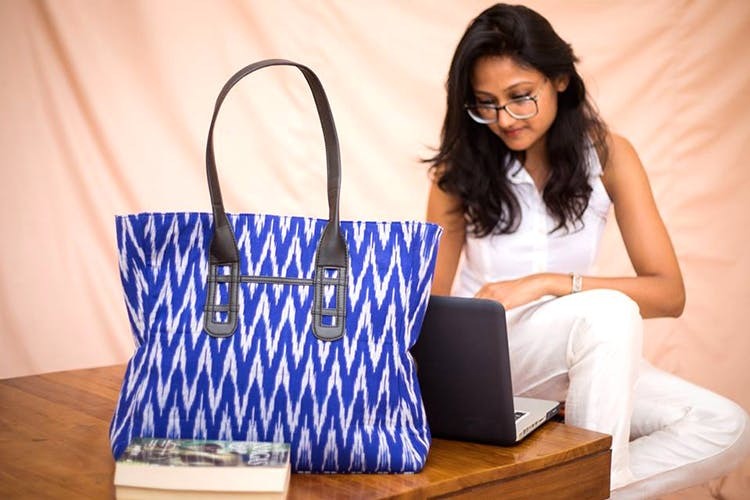 This Brand Is Giving Us Bags In Traditional Ikat And Kalamkari Prints & They Are Just Wow!